This May we are offering a one-time box of fresh spring plants like stinging nettle, cleavers, mullein leaf, dandelion root, japanese knotweed and more! How it works: Purchase your box by April 18th. We will send out a link where you can choose your herbs several days before the pickup. Pick up your herbs at your chosen location. Whats available (may change as the date approaches): stinging nettle, cleavers, garlic mustard, japanese knotweed root, japanese knotweed shoots, chives, catnip, chickweed, yellow dock root, echinacea root, dandelion leaf and root, comfrey root. Pick any five for the box and add on extras as desired. 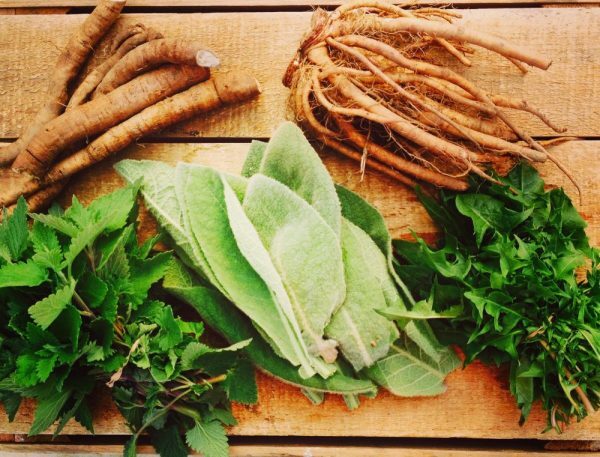 Are you already a member of our fresh herb CSA? Great! You will enjoy this add-on of spring herbs to your share as there are many plants like nettle, cleavers, garlic mustard, knotweed shoots and chickweed that we only harvest at this time of year. Not a member yet? Don’t worry, you don’t have to be a CSA member to get the spring share, however we would love if you joined us anyways! How much is in a “bunch” of an herb? Sizes vary depending on availability but we like to give you enough of each herb to make medicine with. For example, for nettles we give out about a gallon size bag of tops. For dandelion root we will harvest a handful of roots.